Draft: 2005, Oakland Athletics, 18th rd. He and his wife Kelly have two children; Camden and Grady...Graduated from Catasauqua (Penn.) High School in 2001. Opened his 12th professional season with the Cleveland Indians Triple-A affiliate and played in 19 games before being acquired by the Atlanta Braves in exchange for cash considerations on 5/9...Assigned to Triple-A Gwinnett and played in 40 games before Atlanta selected his contact on 7/15…Participated in 73 games between Atlanta and Gwinnett, and 92 total contests between the Atlanta and Cleveland organizations... After having his contract selected by Atlanta on 7/15, played in 33 games, including 28 at catcher (26 starts) through the remainder of the season…Batted .278 (25-for-90) with two home runs, 15 RBI and a .394 on-base percentage...Hit a two-run homer, 8/12 at WSH…The blast was his first in the majors since a two-home run game on 5/14/15 at CHI...Batted .243 (33-for-136) with six home runs and six RBI in 40 games (5/11-7/5) for Gwinnett...Posted a .985 fielding percentage (four errors/270 total chances) in 35 games (34 at catcher, one at first base) with Gwinnett…Caught six-of-33 would-be base stealers...Became the first player in Gwinnett history to hit multiple home runs in consecutive games with back-to-back two-homer contests, 6/12 vs. Norfolk and 6/14 at Lehigh Valley...With GWN, snapped a no-hitter in the ninth inning on 6/22 vs. Indianapolis with a single, before poking a game-ending solo homer in the 10th inning off RHP Jhondaniel Medina...Recorded a 12-game hitting streak with Gwinnett, 6/11-6/25…Hit .354 (17-for-48) with five home runs and 11 RBI in that span...Prior to joining the Braves organization, played in 19 games with Columbus (AAA) batting .246 (15-for-61) with two home runs and 10 RBI...Over 59 total games in the International League, batted .244 (48-for-197) with 11 doubles, eight home runs, 28 RBI and 30 runs scored. Made his third consecutive Opening Day roster...Set career-high totals in games, at-bats, runs, hits, doubles, home runs and RBI...The team went 24-19 (.558) in his starts...Since joining the Mets in 2013, the team is 44-33 (.571) when he starts...Of his 14 career home runs, 10 have either tied the game or given his team the lead, including five of seven this year...Drove in a career best-tying three runs five times (April 12 at Los Angeles-AL, July 6 vs. Texas, August 11 at Philadelphia, August 31 vs. Philadelphia, September 21 at Atlanta)...Threw out 10 of 27 potential base stealers (37 percent) this season, the 10th-best percentage in the NL...Threw out the Reds' Billy Hamilton trying to steal in the eighth inning on April 4...It was the second caught stealing of Hamilton's career in his first 15 attempts; the other was by the Mets' Juan Centeno...Hit the go-ahead home run on April 12 at Los Angeles-AL in the Mets' 7-6, 13-inning win...Also stole his only career base in that game...Is one of only six Mets in team history to hit two or more home runs in the 13th inning or later...The others are: Howard Johnson (3), Kevin McReynolds (2), Tim Harkness (2), Carlos Beltran (2) and Dave Kingman (2)...Became the first catcher in franchise history to drive in a go-ahead run in the seventh inning or later followed by the game winning RBI in extra innings...Finished with his first career four-hit game on May 25, Game 2, vs. Arizona...Hit a home run in three straight games (August 31, September 7 and September 11)...David Wright was the last Met to go deep in three straight games (August 2-September 21, 2013)...Had hits in 23 games, with multiple hits in nine of them (one four-hit game, one three-hit game, seven two-hit games). Made his second consecutive Opening Day roster...Spent the majority of the season in the majors...Was optioned to Las Vegas (AAA) of the Pacific Coast League on August 20, but returned on August 27. Set career highs in every major offensive category. Made 34 starts, with the team going 20-14 (.588 winning percentage) in these games. Four of his six home runs gave the Mets the lead or tied the game...Tied the game on July 4 vs. Arizona with two outs in the 13th with a solo shot. Drove in a career-best three runs, June 5 at Washington. Set a career-high with three hits, August 16 at San Diego. Hit his first home run in a Mets uniform on May 10 vs. Pittsburgh (off Wandy Rodriguez). Made his Mets debut, April 7 vs. Miami...Went 1-3 with a double and an RBI. Had his first career hit with runners in scoring position, June 5 at Washington...Finished the year with a .160 average (4-25) in such situations. Became the 16th Met to hit a home run on his birthday (August 29 vs. Philadelphia, off Ethan Martin). Tossed an inning on June 30 vs. Washington...Allowed two runs and a home run...Became the first Mets position player to pitch since Rob Johnson on May 18, 2012 at Toronto. Threw out seven of 34 potential base stealers (21 percent). Hit .400 (4-10) in five games with the 51s. Began the year with Oakland...Optioned to Sacramento (AAA) of thePacific Coast League on May 27...Claimed off waivers by Chicago (NL) onAugust 27 and was assigned to Iowa (AAA) of the Pacific Coast League...Optioned to Tennessee (AA) of the Southern League on August 31...Recalled by the Cubs on September 4...Made 14 starts in the majors, 10 for Oakland and four for the Cubs...Hit his first major league home run, September 9 at Pittsburgh (Jeff Locke)...Had two hits at Boston on April 30...Collected 14 multiple-hit games for Sacramento (AAA). Was selected from Triple-A Sacramento Aug. 23 and made his Major League debut with the A's...went3-for-17 (.176) with a double and no RBI in five games...added four walks and reached base safely viahit or walk in all five of his contests...went 2-for-7 (.286) against left-handed pitching, 1-for-10 (.100)against right-handers...was 0-for-7 with runners in scoring position...all five of his appearances werestarts at catcher...opponents were successful in each of their five stolen base attempts off him and hehad an 8.36 catchers ERA...most of that came in his ML debut Aug. 25 at New York when he caught theentire game in the A's 22-9 loss...went 0-for-4 with a walk and three strikeouts...his first big league hitcame in his second start Aug. 27 at Boston...singled off Erik Bedard to lead off the fifth inning of thesecond game of the doubleheader...had his first multiple-hit game and extra-base hit in his third startSept. 1 at Cleveland when he went 2-for-4 with a double and two runs scored...started just two of theA's final 25 games, going 0-for-6 with two walks. SACRAMENTO: Spent the balance of the season with the River Cats, batting .287 with 16 home runsand 48 RBI in 99 games...added a team-leading 56 walks for a .388 on-base percentage...had careerhighs in runs (61), walks, stolen bases (7), on-base percentage and slugging percentage (.501) andmatched his career high in batting...ranked sixth in the A's farm system in on-base percentage, seventhin slugging, tied for seventh in home runs, ninth in batting and tied for ninth in walks...named to thePacific Coast League Postseason All-Star team...batted .327 (32-for-98) against left-handed pitching,compared to .271 (67-for-247) against right-handers...slugged .602 against lefties, .462 against righties...hit .305 before the All-Star Break and .228 after the break...batted .196 with runners in scoringposition, including .146 with RISP and two outs...appeared in 61 games at catcher, tossing out 14 of57 (24.6%) attempted base stealers...also played in 25 games at first base and 14 at designated hitter...was 0-for-2 as a pinch-hitter...hit in every spot in the order except third and saw his most action with30 games batting fifth...hit .352 with five home runs and 12 RBI in 21 games batting seventh...batted.160 over his first eight games...then went 24-for-53 (.453) over his next 15 contests from April 20 toMay 6 to raise his average to a season-high .359...had four straight multiple-hit games from April 20-24(8-for-17, .471)...scored a run in eight straight games from April 25 to May 3 (nine runs total)...had hisfirst two-homer game of the season April 28 at Las Vegas...his average slipped below .300 after a 0-for-5 game against Oklahoma City May 19 (.294)...then compiled a season-high, 17-game hitting streakfrom May 21 to June 7...hit .403 (25-for-62) with five doubles, a triple, seven home runs, 17 RBI and 13walks during the streak to boost his average to .330...had a grand slam and a season-high four RBI May27 at Reno...hit .314 with 22 runs, 10 doubles, five home runs, 14 RBI, 16 walks and four stolen basesin 27 games in May, all his best single-month figures in 2011...was batting .327 as late as June 20...thenwent 9-for-46 (.196) over his final 14 contests before the All-Star Break...named to the PCL MidseasonAll-Star Team and was the starting catcher in the Triple-A All-Star Game at Salt Lake City July 13 (went 0 for 2)...was placed on the disabled list July 14 with a left knee laceration...reinstated July 21 and hit.208 (5-for-24) in his first eight games following his return...had his second and final two homer gameAug. 1 against Colorado Springs to boost his average to .304...then went 9-for-49 (.184) over his final15 games before the A's called Aug. 23. Began the season at Double-A Midland, hitting .211 with a home run and three RBI in 11 games beforehe was moved up to Triple-A Sacramento April 22...batted .288 with 10 home runs and 42 RBI in 80games with the River Cats...combined for a .278 average with 11 home runs and 45 RBI in 91 gamesoverall...had a career-high .472 slugging percentage...batted .329 (24 for 73) against left-handed pitchingand .260 (56 for 215) against right-handers...had a .222 batting average with four home runs and 20RBI in 40 games before the All-Star Break...then hit .355 with seven home runs and 25 RBI in 40 gamesafter the break...logged a .244 batting average with the bases empty, .325 with runners on, including.338 with runners in scoring position...hit .292 with 10 home runs and 41 RBI in 76 games at catcherand .163 in 15 games at designated hitter...batted .219 when leading off an inning...committed nine errorsin 76 games at catcher for a .983 fielding percentage...tossed out 25 of 60 (41.7%) attempted basestealers...also appeared in two games at first base...hit in every spot in the order except third...saw hismost action in the nine spot where he hit .356 (31 for 87) in 27 games. Spent most of the season at Triple-A Sacramento where he batted .261 with 12 home runs and 45 RBIin 78 games...also hit .298 with three home runs and nine RBI during a 16-game stint with Double-AMidland from April 29 to May 18...combined for a .267 batting average, 15 home runs and 54 RBI in94 games overall...the home runs tied for sixth best in the A's farm system and he also ranked ninthin slugging (.462)...hit .287 with seven home runs in 101 at bats against left-handed pitching and .259with eight home runs in 228 at bats against right-handers...batted .304 when leading off an inning...hit .244 with 11 home runs and 42 RBI in 65 games before the All-Star Break and .326 with four homeruns and 12 RBI in 29 games after the break...appeared in 77 games at catcher and tossed out 24 of 72(33.3%) attempted base stealers...also hit .328 (21 for 64) with four home runs and 13 RBI in 17 gamesat designated hitter and struck out in his only at bat as a pinch hitter...hit in every spot in the order fromfourth through ninth and saw his most action with 53 games hitting eighth. Spent the entire season at Double-A Midland and hit .274 with 11 home runs and 64 RBI in 117games...had career highs in games, at bats (430), runs (57), hits (118), triples (4) and strikeouts (140)and matched his best in doubles (29)...the doubles tied for sixth most in the A's farm system and he alsoranked 10th in extra base hits (44)...finished second on the RockHounds in doubles (29)...led the TexasLeague and all Double-A batters in strikeouts...was named to the TL Midseason All-Star team...led TLcatchers in games (115), total chances (952), putouts (861) and passed balls (20) and tied for the lead inerrors (13)...tossed out 54 of 166 (32.5%) attempted base stealers, which was third best in the league...hit .340 against left-handed pitching and .255 against right-handers...had a .336 average with runners inscoring position and was 10 for 23 (.435) with 22 RBI with the bases loaded...including a grand slam,May 4 against Frisco...his best month of the season was May when he batted .330 with 10 doubles, four home runs and 26 RBI in 23 games...played for Escogido in the Dominican Winter League followingthe season and hit .194 with a home run and eight RBI in 14 games. Began the season at Single-A Stockton and hit .319 with 13 home runs and 47 RBI in 56 gamesbefore earning a June 20 promotion to Double-A Midland...went on to bat .204 with four home runsand 20 RBI in 50 games with the RockHounds...combined for a .262 batting average, 17 home runs and67 RBI in 114 games total...had career highs in doubles (29), home runs, RBI, walks (44) and slugging(.468)...ranked fifth in the A's farm system in home runs...batted .260 against lefties and .263 againstrighties...connected for 10 of his 17 home runs in the seventh inning or later...committed five errors in53 games at catcher with Stockton (.989 fielding percentage) and tossed out 23 of 69 (33.3%) attemptedbase stealers...then made 11 errors in 56 games at Midland (.976 fielding percentage) and tossed outjust 14 of 77 (18.2%) attempted base stealers...his 11 errors at Midland were the most among all TexasLeague catchers...his average increased each month at Stockton as he hit .288 in April, .321 in May and.344 in June...had his lone four-hit game May 12 at High Desert when he was 4 for 5 with a double, atriple and three RBI...homered in four straight games from June 6 to 9, including his first of two twohomergames June 6 at Bakersfield...also had a two-homer game for Midland Aug. 28 at San Antonio...hit safely in each of his final 12 games at Stockton and his first game at Midland for a season best 13-game hitting streak from June 6 to 20 (.375, seven doubles, five home runs and 10 RBI)...was named tothe California League midseason All-Star team and went 1 for 4 with a double and a walk in the gameagainst the Carolina League All-Stars June 19 at Stockton...was promoted to Midland the next day...had an 11-game hitting streak from July 24 to Aug. 9 (14 for 40, .350). Spent the entire season at Single-A Kane County and batted .287 with 14 home runs and 57 RBIin 109 games...the batting average was ninth best in the A's farm system...hit .363 against left-handedpitching and .262 against right-handers...batted .273 or better in each month of the season, including aseason best .316 in May...tied for the lead among Midwest League catchers in games (95) and errors(12)...tossed out 51 of 122 (41.8%) attempted base stealers...hit in every spot in the order except firstand second and saw his most action in the five (33 games) and four (30 games) spots in the order...wasnamed to ML midseason All-Star Team...had a season high four hits April 18 against South Bend...homered twice and added a double June 13 at Burlington...batted .256 with two doubles, a triple, threehome runs, 11 RBI and eight runs scored in nine postseason games for Kane County. Made his professional debut at Single-A Vancouver and hit .233 with five home runs and 18RBI in 43 games...hit .273 against left-handed pitching and .217 with four of his five home runs againstright-handers...his average increased slightly to .263 with runners in scoring position...led NorthwestLeague catchers with a .995 fielding percentage as he committed just two errors in 39 games...alsotopped league backstops in total chances (369) and putouts (343)...tossed out 16 of 42 (38.1%) attemptedbase stealers...his best single month batting average came in August when he hit .232...was 2for 15 (.133) with four walks in five postseason games for the Canadians. 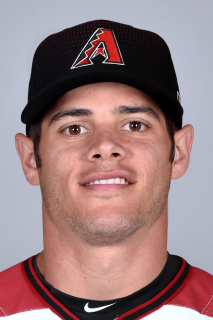 November 2, 2018 C Anthony Recker elected free agency. March 5, 2018 Arizona Diamondbacks signed free agent C Anthony Recker to a minor league contract and invited him to spring training. March 5, 2018 C Anthony Recker assigned to Reno Aces. October 10, 2017 C Anthony Recker elected free agency. July 27, 2017 C Anthony Recker assigned to Rochester Red Wings from Chattanooga Lookouts. July 26, 2017 Minnesota Twins optioned C Anthony Recker to Chattanooga Lookouts. July 24, 2017 Atlanta Braves traded cash, C Anthony Recker and Jaime Garcia to Minnesota Twins for RHP Huascar Ynoa. July 21, 2017 Atlanta Braves selected the contract of C Anthony Recker from Gwinnett Braves. May 23, 2017 Atlanta Braves sent C Anthony Recker outright to Gwinnett Braves. May 20, 2017 Atlanta Braves designated C Anthony Recker for assignment. April 27, 2017 Atlanta Braves optioned C Anthony Recker to Gwinnett Braves. April 2, 2017 Atlanta Braves recalled Anthony Recker from Gwinnett Braves. March 21, 2017 Atlanta Braves optioned C Anthony Recker to Gwinnett Braves. July 15, 2016 Atlanta Braves selected the contract of Anthony Recker from Gwinnett Braves. July 14, 2016 Gwinnett Braves activated C Anthony Recker from the temporarily inactive list. July 6, 2016 Gwinnett Braves placed C Anthony Recker on the temporarily inactive list. May 9, 2016 Cleveland Indians traded C Anthony Recker to Atlanta Braves for cash. May 9, 2016 C Anthony Recker assigned to Gwinnett Braves. April 6, 2016 C Anthony Recker assigned to Columbus Clippers. November 27, 2015 Cleveland Indians signed free agent Anthony Recker. November 6, 2015 C Anthony Recker elected free agency. November 5, 2015 New York Mets sent C Anthony Recker outright to Las Vegas 51s. November 2, 2015 New York Mets activated C Anthony Recker. October 9, 2015 New York Mets reassigned C Anthony Recker to the minor leagues. August 12, 2015 New York Mets recalled C Anthony Recker from Las Vegas 51s. July 31, 2015 New York Mets optioned C Anthony Recker to Las Vegas 51s. July 20, 2015 New York Mets recalled Anthony Recker from Las Vegas 51s. June 14, 2015 New York Mets optioned C Anthony Recker to Las Vegas 51s. August 27, 2013 New York Mets recalled Anthony Recker from Las Vegas 51s. August 20, 2013 New York Mets optioned Anthony Recker to Las Vegas 51s. October 25, 2012 New York Mets claimed Anthony Recker off waivers from Chicago Cubs. October 24, 2012 Chicago Cubs designated Anthony Recker for assignment. September 4, 2012 Chicago Cubs recalled C Anthony Recker from Tennessee Smokies. August 31, 2012 Anthony Recker assigned to Tennessee Smokies from Iowa Cubs. August 27, 2012 Oakland Athletics traded C Anthony Recker to Chicago Cubs for C Blake Lalli. August 27, 2012 Chicago Cubs optioned Anthony Recker to Iowa Cubs. August 27, 2012 Anthony Recker assigned to Iowa Cubs. August 20, 2012 Oakland Athletics designated Anthony Recker for assignment. May 28, 2012 Oakland Athletics optioned C Anthony Recker to Sacramento River Cats. August 23, 2011 Oakland Athletics selected the contract of Anthony Recker from Sacramento River Cats. December 17, 2010 Oakland Athletics invited non-roster C Anthony Recker to spring training. July 21, 2010 Anthony Recker roster status changed by Sacramento River Cats. July 16, 2010 Sacramento River Cats placed C Anthony Recker on the 7-day disabled list. July 15, 2010 Sacramento River Cats activated C Anthony Recker from the 7-day disabled list. June 27, 2010 Sacramento River Cats placed C Anthony Recker on the 7-day disabled list. Strained oblique. May 26, 2010 C Anthony Recker assigned to Sacramento River Cats from Midland RockHounds. May 23, 2010 Anthony Recker assigned to Midland RockHounds from Sacramento River Cats. April 22, 2010 Anthony Recker assigned to Sacramento River Cats from Midland RockHounds. April 5, 2010 Anthony Recker assigned to Midland RockHounds from Sacramento River Cats. December 14, 2009 Oakland Athletics invited non-roster C Anthony Recker to spring training. May 19, 2009 Anthony Recker assigned to Sacramento River Cats from Midland RockHounds. April 30, 2009 Anthony Recker assigned to Midland RockHounds from Sacramento River Cats. November 17, 2008 Anthony Recker assigned to Sacramento River Cats from Midland RockHounds. June 17, 2005 Oakland Athletics signed C Anthony Recker.